This contest awards $1,500 in prizes to a piece of lasting nonfiction that is outside the realm of conventional journalism and has relevance to North Carolinians. Subjects may include traditional categories such as reviews, travel articles, profiles or interviews, place/history pieces, or culture criticism. The first-, second-, and third-place winners will receive $1,000, $300, and $200 respectively. 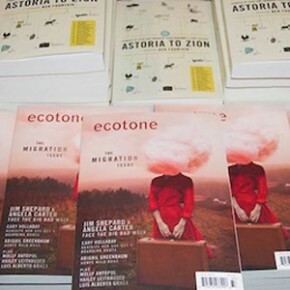 The winning entry will be considered for publication by Ecotone. Final judge Benjamin Rachlin grew up in New Hampshire. He studied English at Bowdoin College, where he won the Sinkinson Prize, and writing at the University of North Carolina Wilmington, where he won Schwartz and Brauer fellowships. His work has appeared, or is forthcoming, in the New York Times Magazine, Rolling Stone, Virginia Quarterly Review, TIME, Pacific Standard, Orion, LitHub, and Five Dials. His first book, Ghost of the Innocent Man: A True Story of Trial and Redemption, is available now from Little, Brown & Company. The 2018 Rose Post Creative Nonfiction Competition is administered by the University of North Carolina at Wilmington Department of Creative Writing, a community of passionate, dedicated writers who believe that the creation of art is a pursuit valuable to self and culture. The contest is open to any writer who is a legal resident of North Carolina or a member of the North Carolina Writers’ Network. The deadline for submissions is January 15, 2018 (postmark). Rose Post worked for the Salisbury Post for fifty-six years as a reporter, feature writer, and columnist. She won numerous state and national awards for her writing and earned the N.C. Press Women’s top annual award four times. She received the O. Henry Award from the Associated Press three times, the Pete Ivey Award, and the School Bell Award for educational coverage. Nationally, she won the 1989 Ernie Pyle Award, the Scripps Howard Foundation National Journalism Award for human-interest writing, and the 1994 National Society of Newspaper Columnists’ Award. Entries can be submitted in one of two ways: Send two printed copies through the U.S. Postal Service (see guidelines and address below), along with a check for the appropriate fee, made payable to the North Carolina Writers’ Network. Or submit an electronic copy online at http://ncwriters.submittable.com, and pay by VISA or MasterCard.